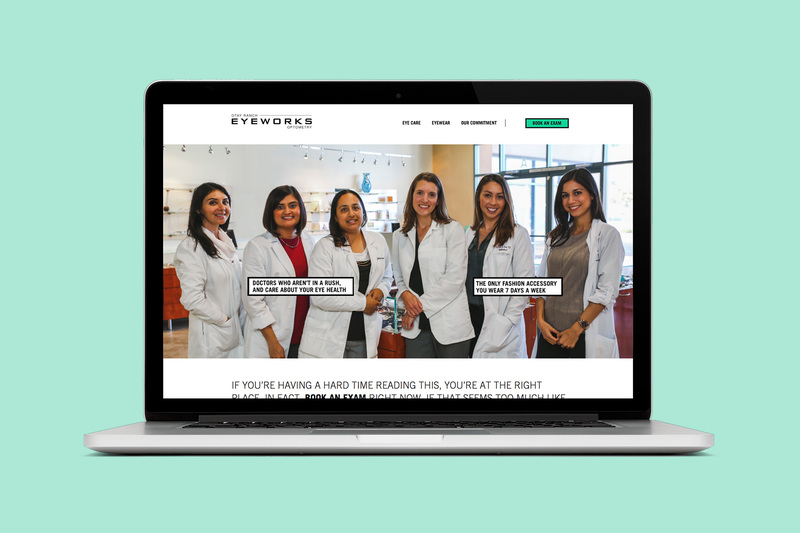 Rebranding and website re-design for Eyeworks, an eyewear and optometry provider, increasing eye exams booked online by an average of 140% and unique pageviews by 46%. When Eyeworks approached us, they were already a successful company. They had a brand established, a logo, a website, excellent retail locations with one of the biggest selections of eyewear in San Diego, and of course sales were great, but they felt something was missing. They wanted to improve on their success, and create a more unique experience that would leave a mark on San Diego and in the eyewear/optometry industry. 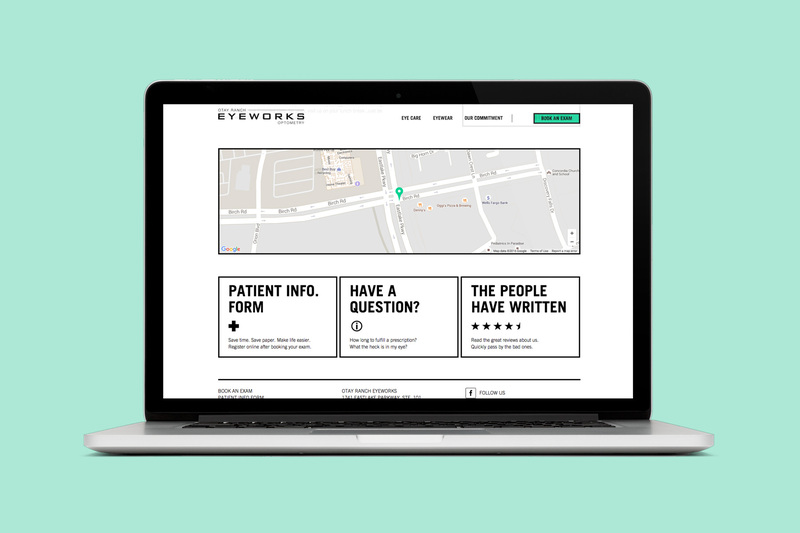 Our primary objective was to redo the Eyeworks website with an emphasis on user ability to book an exam, while also establishing a new look, feel, and voice for the brand. We assessed their current site and began to sift through content, organizing it, cutting it down, and adding what we thought to be useful information. 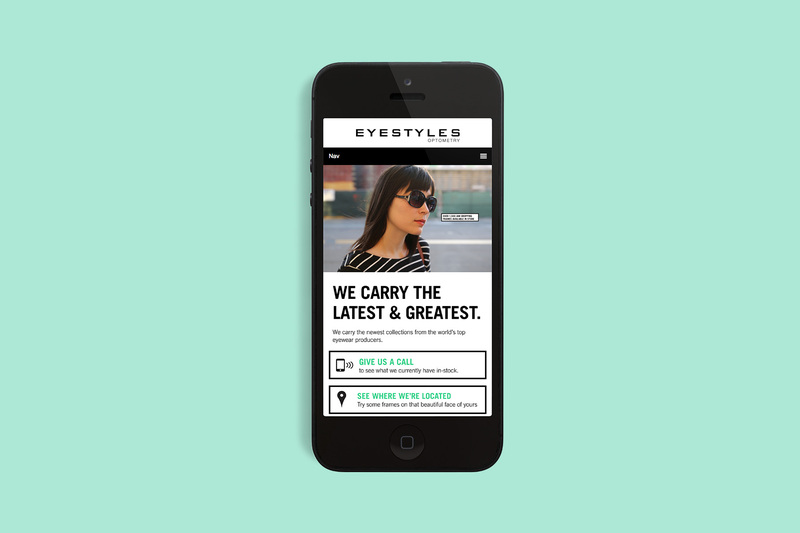 After the content was organized we developed a simple site-map that cut their main navigation from 9 sections down to 3: Eye Care, Eyewear, Our Commitment. Next, we presented directions for overall look and feel. These were essentially mood boards that highlighted themes of high-end fashion, colorful play of seasonal changes, industrial modernism with dry humor, and the final direction put emphasis on active lifestyles. Eyeworks liked the modern, bold direction infused with cheeky personality and play. From here we began design on the website. Trade Gothic was chosen for it’s bold and modern characteristics. Bold lines were used to frame and divide elements but also served a conceptual purpose; The frame is used to highlight visual experiences that we take for granted. On the website, it’s typography that is primarily framed, but this can expand to scenery, ads, eyewear, etc. While Eyeworks had a lot of good content on their previous website in terms of information, none of it was in a unique brand voice and came off as sterile and repetitive. We distilled the copy down to the essentials and eliminated instances of repetition. We reworked the copy to have a playful, cheeky personality to break the clinical feel of their previous site. Eyeworks had no unique imagery to pull from aside from low resolution shots of their interior space and optometrists. Each page on the new website featured a hero image as the first thing the user sees, so we produced high quality, eye-catching imagery to use site wide. We also shot the interior retail space and took portrait style photos of the optometrists. A lot of energy was invested in the “Book an Exam” section. We were able to simplify the booking form from nearly 30 fields of information that the user needed to provide, down to 9, which made ours one of the fastest booking processes when compared to the competition. This made for a less daunting process for users, increasing the likelihood of online bookings. 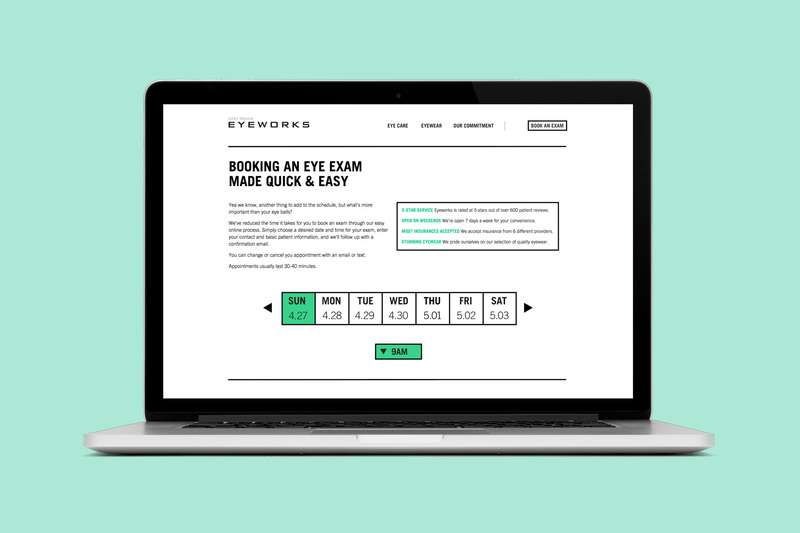 We’ve been able to track the numbers of exams booked online since the launch of the new Eyeworks website compared to their old website and, on average, we’ve seen a 140% increase in exams booked. To increase visibility and access to the “Book and Exam” section we highlighted it at the top right corner of the website and made it a fixed element, along with the rest of the main navigation, so that it would always be visible and easily accessible as the user scrolls down any page of the website. In an industry that is often sterile and clinical we were able to inject some personality and fun into the brand. More importantly we were able to turn a messy booking process into something simple and easy which would in turn create more overall sales. You can see our work in live action at oreyeworks.com.